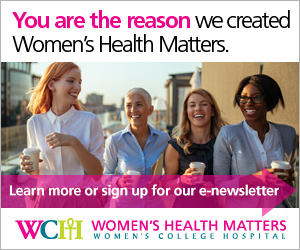 Women's Health Matters - What’s the difference between a heart attack, heart failure, and stroke? Heart attack, heart failure and stroke are different conditions that affect people in different ways. Dr. Paula Harvey, medical director, Women's Cardiovascular Health Initiative at Women’s College Hospital, explains the difference. A heart attack happens when the heart is not getting enough oxygenated blood, usually because one of the major blood vessels that supply the heart has become blocked. The most common cause of heart attacks is the accumulation of plaque in an artery. Preventing plaque buildup in the arteries can prevent the formation of blood clots that cause heart attacks. In heart attack survivors, the affected part of the heart is scarred, and can no longer help the heart pump blood. This is one of the causes of heart failure. A heart attack is a medical emergency, and can be fatal. Heart failure means that the heart is not pumping effectively, either because the heart is damaged and unable to contract properly, or because the heart has become too stiff. In order to pump blood effectively, the heart must be able to contract to push blood out, and then relax to fill up with more blood. Damage to the heart muscle can make it unable to contract properly. If the heart becomes too stiff, it is unable to relax. That makes it unable to draw in enough blood from the lungs to fill properly. “So a heart attack can lead to heart failure because it can damage the muscle. There are many other causes of heart failure due to pump failure, but damage from heart attacks is one of the most common,” Dr. Harvey says. In addition to an inability to pump enough oxygenated blood to the body, heart failure can also cause back pressure into the lungs, pushing fluid into the lungs. In most cases, heart failure is a progressive chronic condition. A stroke happens when part of the brain does not get enough oxygenated blood. Although stroke happens in the brain, it is sometimes confused with heart attack, possibly because both are related to blood flow. “Stroke is caused by problems with blood flow to the brain, as opposed to a heart attack which is obviously blood flow to the heart,” Dr. Harvey explains. A stroke can be caused by a blocked blood vessel (called ischemic stroke, the most common type) or by a ruptured blood vessel causing bleeding in the brain (hemorrhagic stroke). Like heart attack, ischemic stroke is often caused by plaque buildup or a dislodged blood clot causing a blockage. The disruption of blood flow to the brain during a stroke can damage that part of the brain. It is vital to re-establish blood flow as soon as possible to minimize damage.